Follow the debate via our live-streamed session Building Financial Market Resilience – taking place at 09:00 on Thursday 12 May at the World Economic Forum on Africa, in Kigali. Africa stands at a crossroads. Economic growth has taken root across much of the region. In many countries, exports are booming, foreign investment is on the rise, and dependence on aid is declining. Governance reforms are transforming the political landscape. Democracy, transparency and accountability have improved, giving Africa’s citizens a greater voice in decisions that affect their lives. At the same time, many African governments are failing to convert the wealth created by economic growth into opportunities that all Africans can exploit to build a better future. Inequality is increasing. Poverty is not falling nearly as fast as it should. And Africa’s share of global malnutrition and child deaths is rising fast. Africa needs long-term growth that benefits all Africans. That requires nothing less than an economic transformation. Sustainable and inclusive financing are a vital ingredient of such a transformation. The lack of access to formal financial services is a major obstacle to the advent of transformative growth on the continent. No region has a lower level of access to financial services. Only one in five Africans have any form of account at a formal financial institution; the poor, rural dwellers and women face the greatest disadvantage. Such financial exclusion undermines opportunities for reducing poverty and boosting growth that benefits all. No sector suffers more from financial exclusion than agriculture. A 2014 report from the Africa Progress Panel, Grain, Fish, Money: Financing Africa’s Green and Blue Revolutions , states that farmers need access to finance – including credit, savings and insurance – to insure themselves against risks such as drought, and invest more effectively in better seeds, fertilizers and pest control. But Africa’s farmers lack access to insurance, so they have to put their meagre savings into contingency funds to deal with emergencies, rather than investing them in boosting productivity. Similarly, because they lack access to loans and saving institutions, they are often unable to respond to market opportunities. The region’s financing environment must be transformed. Ten years ago, countries across Africa were still emerging from the Heavily Indebted Poor Countries initiative . Today, many of the same countries have entered sovereign bond markets. But Africa cannot meet its financing needs in infrastructure and skills development through aid and commercial market debt financing alone. That is why there is no substitute for domestic financing. Unfortunately, economic growth has done little to increase either the rate of savings or the proportion of GDP that is collected in domestic tax revenues – outcomes that point to the need for institutional reforms. Some countries are harnessing pension funds for energy financing. Ghana, Mozambique and Nigeria, for example, have used their pension funds to engage in a more active financing strategy of their energy sectors. In general, the scale of pension-fund investment remains limited but illustrates the potential for tapping into a deeper pool of savings. 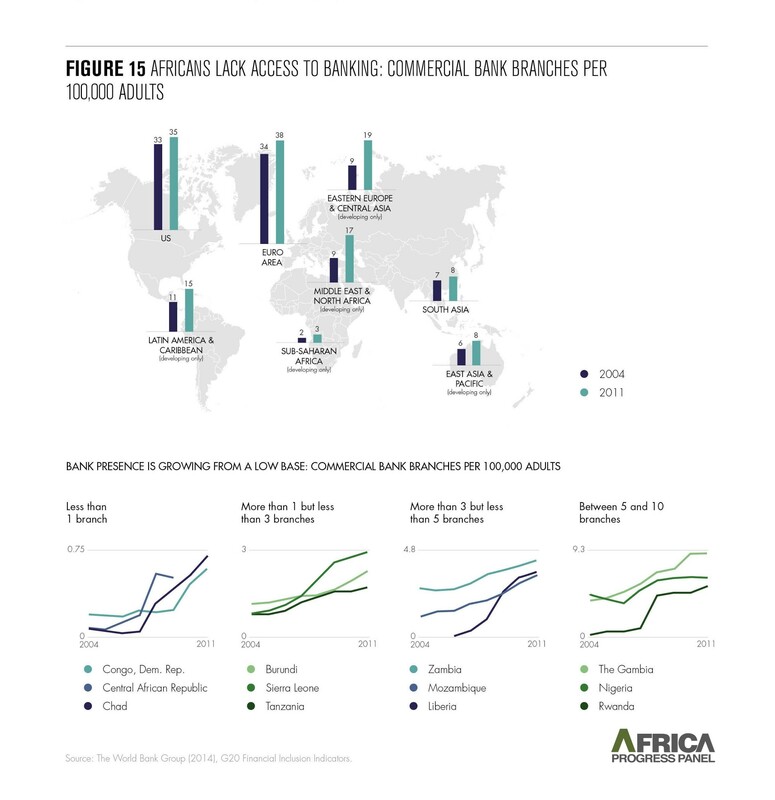 Africa’s banking and finance sector needs a shake-up. The good news is that this is starting to happen. Peer-to-peer banking and mobile banking are beginning to thrive. More and more Africans are embracing the power of domestic savings – and insurance markets will soon emerge as an exciting and effective means to invest those savings. Mobile technology is becoming pivotal in addressing the needs of the 80% of citizens who are excluded from the financial system. Local banks must now begin to function more as “real” banks to serve the demands of small and medium-sized enterprises, many of which are run by dynamic “agropreneurs”. Pension funds will be increasingly seen as an essential and exciting means to provide long-term capital. Transforming the financing environment is the way to unleash Africa’s full potential, for the benefit of all Africans for generations to come. Let’s start now.